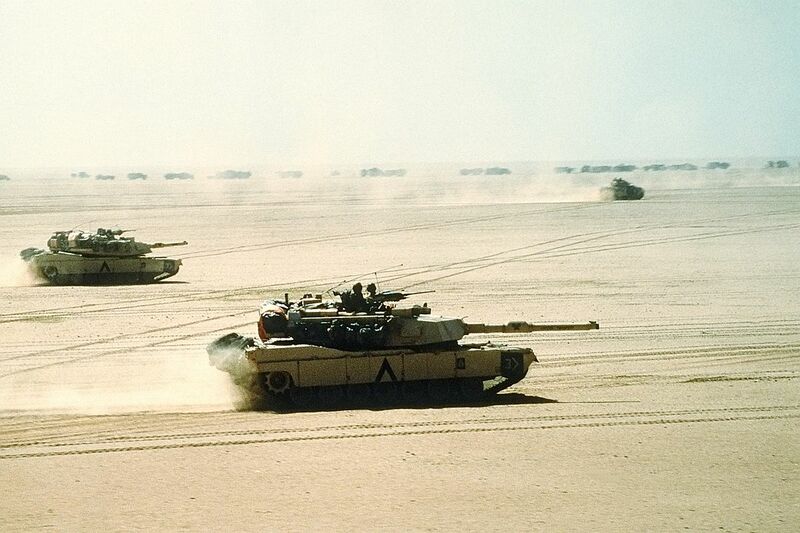 The men of the 2nd Armored Cavalry Regiment spearheaded one of the American columns that invaded Iraq on Feb. 23, 1991. After three days of light fighting they stumbled into one of the largest Iraqi armored formations and annihilated it with cannons, TOW missiles and mortars in the Battle of 73 Easting, often called "the last great tank battle of the 20th century." Then-Capt. (now Lt. Gen.) H.R. McMaster, commander of Eagle Troop, 2nd Squadron, 2nd ACR, literally wrote the book on the battle and commanded one of the lead elements in the fight. Helicopters buzzed over Eagle Troop as the ground invasion of Iraq began on Feb. 23. The mission of the 2nd ACR was simple in theory but would be challenging to achieve. They were to cut off Iraqi retreat routes out of Kuwait and destroy the large armored formations thought to be hiding in the flat, featureless desert. The empty desert could be challenging to navigate since there were no features to use for direction. Heavy rains and windstorms limited visibility as the tanks and other vehicles felt their way through the desert. Fox troop made contact first, destroying a few enemy tanks. 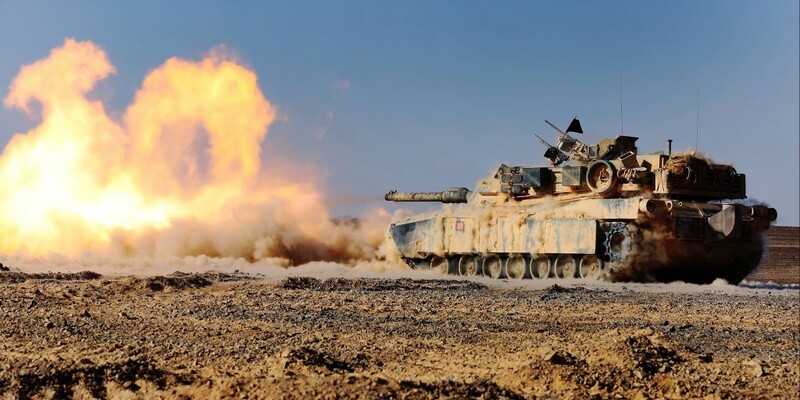 Over the next couple of days, 2nd Squadron tanks and vehicles would encounter enemy observation and scout vehicles and destroy them with missiles and cannons, but they couldn't find the Iraqi Republican Guard divisions they knew were dug somewhere into the desert. In the afternoon of Feb. 26, 1991, McMaster was pushing his troop through a sandstorm when he crested a rise and there, directly in front of him, was an entire division of Iraqi tanks with elite crews. Finding himself already in range of the enemy, he immediately gave the order to fire. The enemy had parked themselves away from the slight rise so that they would be hidden and so incoming American tanks would be forced to drive down the hill towards them. This exposed the relatively weak top armor of the tank to the Iraqi guns. But the Iraqis had lost most of their scout vehicles and so were just as surprised as the U.S. commanders when the two armored forces clashed, leaving them unable to capitalize on their position. McMaster's opening salvo set the tone for the battle. His first shot was a HEAT round that destroyed a tank cowering behind a berm. His second shot, a depleted uranium sabot shell, shot through an Iraqi tank that was swiveling to fire on him. As his crew targeted a third enemy, the driver realized they were driving through a minefield and began taking evasive action. The few seconds of surprise was all we had needed. 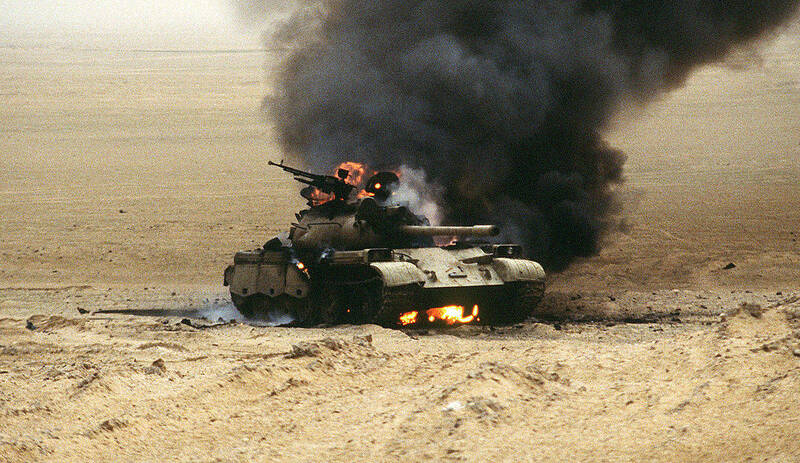 Enemy tanks and BMP's (Soviet-made armored personnel carriers) erupted in innumerable fire balls. The Troop was cutting a five kilometer wide swath of destruction through the enemy's defense. The Bradley fighting vehicles joined the tanks, firing TOW missiles at the enemy armor and using their guns to cut down Iraqi infantry. Mortar and artillery support opened up, raining fire onto the remaining Iraqi positions. The American forces cut down 30 tanks, 14 armored vehicles, and hundreds of infantrymen before reaching their limit of advance, the line they were originally told to halt at. But McMaster ordered the troop to continue attacking, fearful that the Iraqis would be able to regroup and wage a strong counterattack. At 23 minutes since first contact, McMaster declared it safe to halt his troop's advance. The single armored troop had crippled the Iraqi flank with zero casualties. One American tank from the 2nd Squadron headquarters had received light damage from a mine. Near the Eagle Troop position, Ghost, Killer, and Iron troops were mixing it up other Iraqi units and trying to catch up to Eagle. The enemy made a few half-hearted attempts at counter-attacking the U.S. tanks, but they were quickly rebuffed. That night, the U.S. called on the Iraqi's to surrender and it was answered by droves of troops. About 250 survivors surrendered to Eagle Troop. Up and down the U.S. lines, the story was similar to that of Eagle Troop. The Iraqis suffered nearly 1,000 casualties, 85 tanks destroyed, 40 armored vehicles destroyed, 30 wheeled-vehicles lost, and two artillery batteries annihilated. The U.S. suffered 12 men killed, 57 men wounded, and 32 vehicles destroyed or damaged.